Artsenta is a place where people can be creative - whether it's drawing, painting, crafts, creative writing, making pottery or playing music. One of the first creative spaces in New Zealand and originally the Creative Expression Unit at Cherry Farm Hospital, Artsenta celebrated its 25th anniversary in 2011. It offers a range of materials and equipment for people who use mental health services. Some artists prefer using more structured classes and others come and work on individual projects. 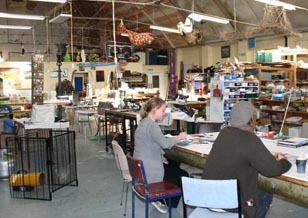 Based in a large upstairs space in the heart of Dunedin, Artsenta receives most of its funding from the Ministry of Health (through the Otago District Health Board) and a small amount of funding from the Ministry of Social Development. Its director, Jill Thomson, says people come to Artsenta because they want to create something. Sometimes, they also come for the company. There’s a big table where people can sit together, create and talk. There are also opportunities to take part in group activities or to work independently. Artsenta has six art workers and offers weekly sessions in print making, glass work, drawing, jewellery, music and pottery. 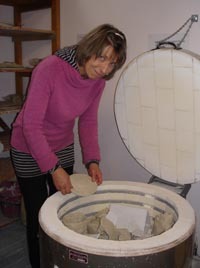 The pottery room, for instance, includes an electric potters wheel, an electric kiln, a pugmill for recycling clay and a range of clays, slips, stains and glazes. I ts music studio is home to drums, guitars, a keyboard and things that can be banged or shaken. Every couple of months, there’s an in-house lunchtime concert where singers, songwriters and poets get to perform in front of a supportive audience. Songwriters are also able to record their songs and have them broadcast on Artsenta’s fortnightly radio show called Artwaves on Toroa Radio 1575 AM. Occasionally, Artsenta presents exhibitions at its Crawford Street space, in Dunedin City Council’s Community Gallery or in local cafes. It also has a permanent gallery space in Dunedin Public Hospital where artworks are placed in permanent glass-covered frames and hung for a couple of months. Original generation time 1.3746 seconds. Cache Loaded in: 0.0005 seconds.